Home › FAQ › What are Summer Courses Like in College? What are Summer Courses Like in College? Students who want to shorten their overall stay in a degree program typically elect to schedule summer courses in college. These courses cover the same material that their more traditional counterparts do during the fall and spring semesters, but they do things just a bit differently. 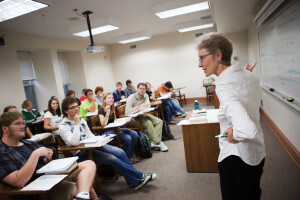 With an accelerated format and more frequent classroom meetings, these summer classes endeavor to cover the same amount of material in roughly half the time. With a solid summer schedule, they’re short and accelerated enough to help students eliminate the equivalent of a full spring or summer semester with the right amount of planning. So, what do these classes look like? How do they work? The first thing to know about summer classes is that they often function as six-week accelerated sessions. Most colleges and universities schedule two such sessions during the summer, known as the “Summer I” and “Summer II” sessions. Students can typically take either two or three courses per summer session, depending on their class level and current GPA. With these sessions scheduled, students should prepare for a significant departure from what they’ve experienced during more conventional semesters as their college or university of choice. First and foremost, summer classes are less than half the length of spring and fall classes. This means that each class will typically meet four days per week, Monday through Thursday, instead of just two or three times each week. Also, each class will last longer. Many summer classes meet four times per week and last for 90 minutes to two hours each day. Students can expect roughly twice the amount of reading and homework per week, since a 15-week course is being condensed into just under half that amount of time. Most classes will also schedule a quiz or full-blown test at least once each week, since students will be completing entire units of the course’s core components very quickly. At the conclusion of the course, a final exam is given and summer students have one week before the next six-week flurry of academic activity begins. Costs and Benefits: Are Summer Classes Worth Taking? Summer classes are typically offered at the same tuition rates as fall and spring classes, despite their more compact and accelerated nature. Even so, students can use financial aid funds like grants and loans to pay these expenses. In many ways, summer courses can be thought of as a third semester: The same policies, tuition charges, and other fees will be required of all enrolled students. In many cases, students can also extend their on-campus housing to cover the summer session. This further adds to the “third semester” atmosphere. As far as whether these classes are worth it, there’s one thing to consider: The expenses may not be any lower, but the benefit of graduating a semester or two before one’s peers will give them a big advantage when looking for a job and discussion their academic achievements. It certainly shows drive and determination, and it could lead to big rewards in terms of employment or graduate studies after commencement. A shorter time of enrollment at a given college or university also means that students will endure fewer tuition increases, since summer courses are charged at the prior academic year’s rate, according to US News and World Report. That’s a significant savings. Saving time and money while in college is always a smart policy for today’s students. While many students look forward to a few months of freedom during the summer, those who elect to study through this part of the year will graduate sooner, endure fewer tuition increases, and get ahead in the job market. For this reason, it should be a top priority to schedule summer courses in college for many undergraduate students.